Shredaholic has been hit pretty badly by the flu this winter, so apologies for the lack of updates. Many of you have sent in emails that will be responded to over the course of this week, and there’s plenty of new things to be uploaded to the site. As mentioned previously, everyone who subscribed to the newsletter in 2010 was automatically entered into the competition, now that December (and our 6 year anniversary) has ended, so has registration for the competition. Although the site was created on the 21st, it seemed fair to let entries run right up until new years eve just so everyone interested had a good chance to get involved. The winner will be chosen at random from the newsletter subscribers list, so make sure you check back on this page to see the comments feed below, where the winner will be announced later this week. Anyhow, happy new year everyone and best of luck on your guitar projects in 2011. 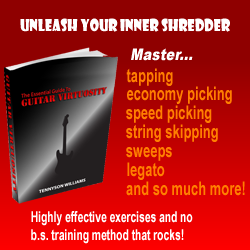 Let’s make it a great year for shredding! Sam, you’ve got an email!